There is no easy answer on the best approach to adopting the Toolkit. Adopting new land use and development regulations can be difficult. It takes a concerted effort to ensure that everybody who is interested has the opportunity to voice their opinion and that people fully understand the Toolkit. Getting the Toolkit adopted is like running a political campaign. This means reaching out to as many people as possible, including neighborhood groups, media outlets, business owners, land owners, homeowners, state and local agencies and environmental interest groups. Learn more about public outreach. State law requires new zoning or subdivision regulations go through a public hearing process prior to adoption. Ultimately your parish or municipal attorney should be consulted to ensure that you are following state law in adopting the Toolkit. Learn more about adopting the Toolkit. Getting the Toolkit adopted is just the beginning. While the Toolkit is intuitive to use, there is a learning curve associated with administering it. Every effort should be made to include local staff in the implementation process. 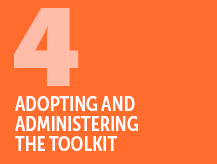 Learn more about managing the Toolkit after adoption.